Some of my favorite font finds have been discovered through lists other bloggers have put together, so I thought it would be fun to gather up some of mine to share with you! I am a wee bit obsessed with pretty fonts and typography, and I love that there are so many gorgeous (and free) fonts out there for anyone to download and use. In the above graphic, I chose to feature seven of my current favorites—using them to display some of my favorite words to write or say (or type). 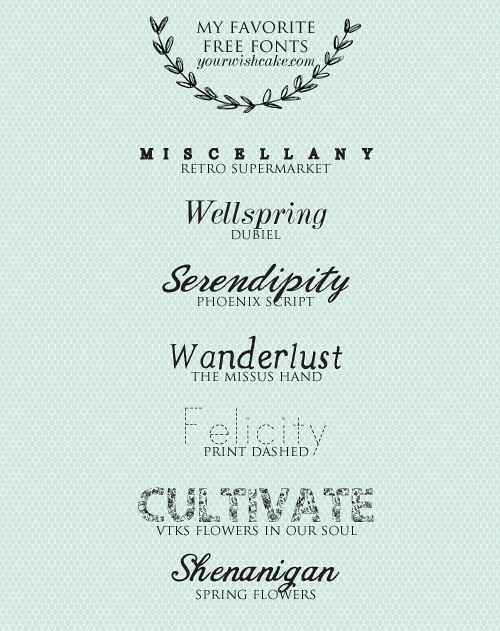 Spring Flowers — Would you believe I put this entire post together only to realize I can't find a source for this font? I know. I'm the worst. I'll keep searching and update this post when I can figure out where you can download it. Deal? Deal. Oh, thanks for sharing! I always love a good font find.